Many people look forward to the day they get a cat collar on their cat. It means that they can finally make their cat their own by giving it an identification tag or name tag and prove that it belongs to them and no one else. It also means that other people do not think there is a stray cat roaming around. Cat collars are also a good way to identify your cat, especially when they have gotten lost and somewhere else happens to find it. It means they can return it back to the owner easily, reducing the stress and anxiety the cat owner is going through. It also means that a cat tracker can be attached easily to the cat without the need of using microchipping. However, some people do not feel a collar on their cat is necessary. This may be because the cat is less comfortable when wearing their cat collar and will be less pleased about wearing it. Cats after all don’t start out with collars so why would they want one attached to them. There is also an argument that because cats don’t want to wear their collars, they may force it off so it may be better not to have one at all. Of course, there are plenty of different types of collar available to choose from, so what is it you should be looking for when you make your decision? Here’s an overview of some of the more popular types of collar you can buy for your cat. This is one of the more traditional collars you can get for your cat. Some people are very keen on these – giving them an early warning system for what the cat might be up to! Originally, though, the idea of having a bell on a cat’s collar was to act as a warning system for birds. The idea being that the noise would frighten the birds away and prevent your cat from getting hold of them. (Presumably, the main reason for this would be to keep your garden populated with birds, rather than having them killed by your pet). These would generally only be used if you suspect your cat of having fleas – either due to them continually scratching themselves or that you’ve noticed some fleas jumping around. It’s a simple fact that every cat will pick up fleas at least once. A flea collar works by emitting substances designed to kill the fleas. You shouldn’t be too concerned about this affecting your cat’s health, as the collars have obviously been designed to work without harming your pet. However, it’s always advisable to read the instructions carefully so you don’t run the risk of causing any irritation to your cat. (Plus you may need to be careful for yourself when handling the collar, of course). We’re not talking about a collar made from the chocolatey biscuit some of you might remember from your childhood. A breakaway collar is one that features a buckle / clasp that breaks the link under pressure. The advantage of this is for those occasions when your cat snags up against something – a tree, bush, fence post etc – and can’t get itself free using its paws. When your cat starts to try and pull away from the things it’s caught itself on, the collar buckle will open up. Thus freeing your cat and allowing it to come back home safely. Cat owners often like to feature the cat’s name and home address details on an identification tag that fits on the collar. Most commonly, these will be thin round metal or plastic tags, that can be personalised with different information, such as phone numbers for when your cat might get lost. We’ve not come across a specific collar that incorporates a cat tracking device. But if you want to make sure you can find your cat when it wanders off someplace, you’ll certainly want to consider attaching a cat tracker to your cat’s collar. 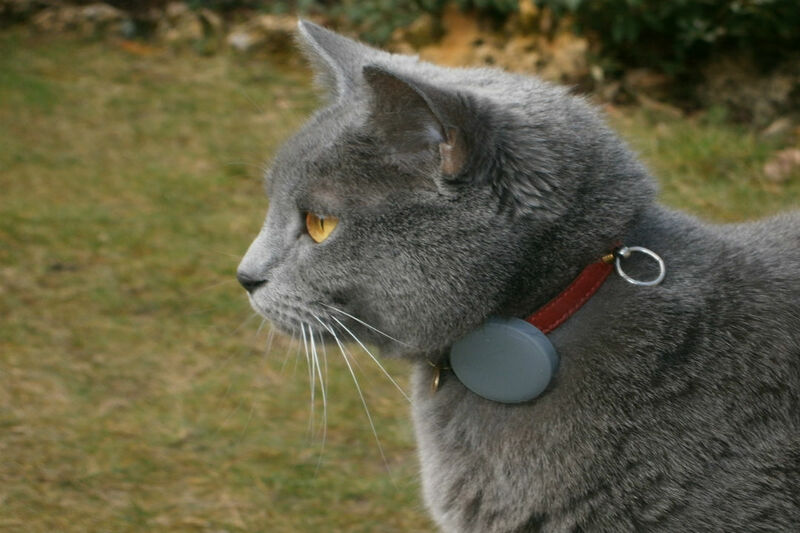 The award-winning Tabcat tracker is lightweight and unobtrusive, so your cat won’t suffer any discomfort from having it attached on their collar. Plus we’ve had many pet owners compliment us on the design of the device – telling us how stylish and attractive it is. Before we wrap up, a word about ensuring the safety of your cat when wearing a collar. The advice from the world famous organisation Cats Protection is to make sure there’s enough leeway in the tightness of the collar for you to slide a couple of fingers underneath. That way the collar will be loose enough to not cause any problems, but tight enough to not run as much risk of getting caught on obstacles. What should you be looking for when choosing a cat collar for your cat?